Infrequently I receive emails from a cab service called London Limousines. I never open them because I am not in London. I had assumed the emails were coming from a Taxi driver in London I had somehow inadvertently given my email address to. 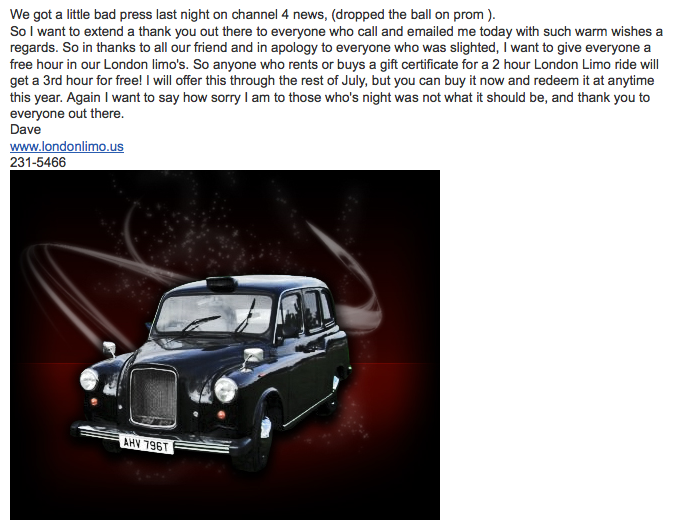 Today I received another email from London Limo with a headline that piqued my interest – Bad Press. Its the first time I can recall a business owner sending me an email to tell me they got bad press. I don’t even know how to categorize somebody who goes out of their way to spread “bad press” about their own business. His confession is instructive though… it proves just how compelling and impactful word of mouth is as a medium. This entry was posted on July 16, 2010 at 4:49 pm and is filed under Public Relations, Word of Mouth. You can follow any responses to this entry through the RSS 2.0 feed. You can leave a response, or trackback from your own site.